Most students arrive at Lauder after several years of work experience. Many have a clear vision of where their career will take them: They may have entrepreneurial ambitions and plans in the works for launching their own ventures, or they may have zeroed in on companies and agencies where they plan to work. But even the most driven and focused students benefit from the guidance offered by Lauder’s dedicated Global Career Advisor, who works with students one-on-one and organizes events throughout the academic year. 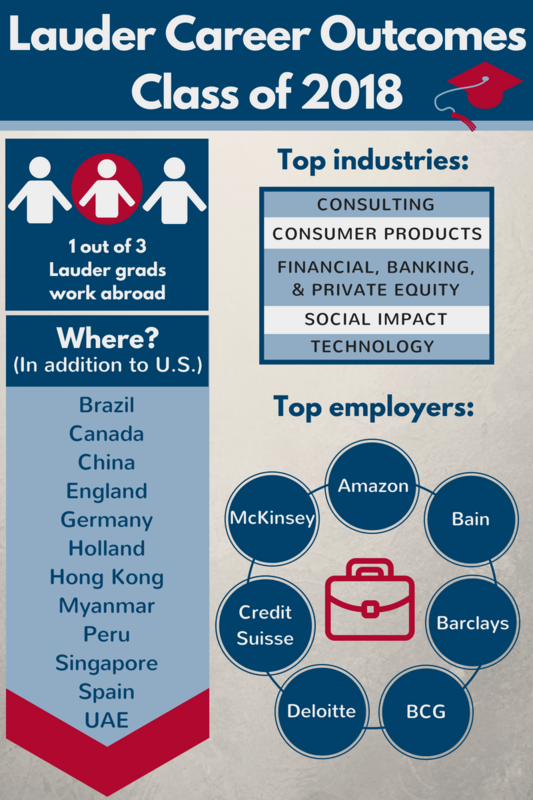 Each year, Lauder graduates obtain a variety of positions around the world. Our Class of 2018 took roles in Brazil, Canada, China, England, Germany, Holland, Hong Kong, Myanmar, Peru, Singapore, Spain and the United Arab Emirates, in addition to the US. In total, approximately one-third of graduates work abroad after graduation. Multiple students also pursue entrepreneurial opportunities. In the fall of 2016, our Global Career Advisor, Kim Conroy, held 120 individual meetings with Lauder students on campus. She spoke with more than 50 percent of first-year Lauder students via Skype during their first summer. Recent graduates gave her exceptionally high ratings for the helpfulness of her career advice, connecting them to Lauder alumni, and building strong relationships with corporations and organizations that interest them. Click through to learn more about the Lauder Institute career guidance expert Kim Conroy. In addition to individual advising, the Lauder Gobal Career Advisor organizes events that connect hundreds of Lauder students to more than three-dozen Lauder alumni in more than a dozen countries. These events represent meaningful learning and networking opportunities that have led to internships and mentorship. Less tangible but equally significant outcomes of these encounters is insight. Hearing from working professionals and business leaders about their career decisions and experiences serves as a reality check to students’ expectations for life after Lauder. These events have pushed students to reevaluate their plans or just make simple tweaks that can transform their career trajectory. At more than a dozen events per semester, students are able to meet representatives from a range of industries and companies on every continent but Antarctica. In 2014 alone, representatives – including CEOs, COOs, and presidents – from firms in Bogota, Hong Kong, Istanbul, London, Mexico City, Paris, Santiago, Sao Paolo, and Shanghai met with Lauder students. Because the Lauder cohort is small, campus visits and videoconferencing bring the possibility of genuine connection. Every student has a chance to meet and shake hands – virtually or in person – with alumni who are committed to the success of the next generation of Lauder graduates. Click the links below to learn more about Lauder career experts who offer individual professional advice, where recent graduates are working now, and alumni who have launched successful new ventures. Lauder Global Career Advisor Kim Conroy shares about her background and the types of career services that are available to Lauder students.